The Bachelor of Social Science (Architectural Studies) – BSSc (AS) – programme is the first part of a two-degree sequence in professional architectural education. This sequence is designed to provide a basis for education in general and preparation for professional work as an architect in particular. Students are encouraged to enrich their core of studies in architecture by exploring lateral relationships with other subjects and disciplines, as well as through independent study and experiencing other cultures. The core of studies consists of design studios and courses in different subject areas. Design studios are structured in a sequential manner, with a foundation studio in the first semester, advancing progressively to a more sophisticated level in architectural design and completed with an integration studio in the last semester of the final year. The courses aim at providing an intellectual base of knowledge in humanities, technology, design computation and professional practice. Application for admission to BSSc (AS) programme (JS4812) should be submitted via the JUPAS Online Application System no later than 5 December 2018. JUPAS applicants are encouraged to submit a design portfolio to our Application Materials Collection Platform no later than 30 May 2019. More details can be found in the portfolio guidelines below. Applicants may be invited to attend an interview or admission test to be scheduled during May – August. For more information on admission requirements, please visit the website of the Office of Admissions and Financial Aid. Application for admission to BSSc (AS) programme should be submitted via the Office of Admissions and Financial Aid Online Application System no later than 3 January 2019 (Year 1 Entry) or 20 February 2019 (Senior Year Entry). You may also submit an Early Consideration Application by 15 November 2018. In addition to fulfilling the General Entrance Requirements of the University, non-JUPAS applicants are required to submit a design portfolio to our Application Materials Collection Platform no later than the application deadline. More details can be found in the portfolio guideline below. Applicants may be invited to attend an interview or admission test to be scheduled during January – August. 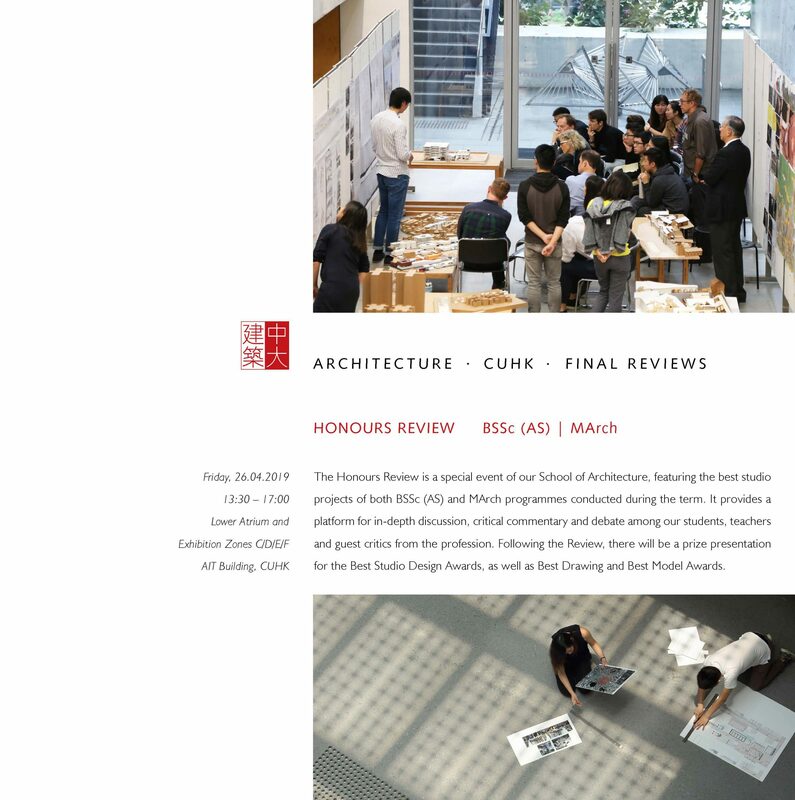 The School of Architecture invites applications from full-time undergraduate students in the Chinese University of Hong Kong to transfer to our BSSc (AS) programme. Applicants should submit an Application Form for Change of Major and a design portfolio to our Application Materials Collection Platform no later than 7 June 2019. Shortlisted applicants will be invited for an interview to be scheduled in June 2019. Applicants should also submit their applications for change of major via CUSIS for the University’s handling. For more information, please refer to the Registration and Examinations Section website.